SIMOcean system platform is designed to be a flexible framework able to communicate with the different information systems currently used by the Portuguese Institute for the Sea and Atmosphere (IPMA) and Hydrographical Institute (IH) to access their datasets or store any of the necessary datasets that are not yet integrated into those systems. Its architecture provides full control to data and product providers to determine differentiated access permissions for each included dataset and be compatible with other information systems currently operational or under development at National or International levels (e.g. SNIMar, NIPIM@R, SNIG). The development of the software components will be based on open source solutions, compliant with Open Geospatial Consortium (OGC) standards that derive from the SenSyF framework, a geospatial data handling framework optimized for big data with cloud based processing capabilities, developed by DEIMOS Engenharia. The SIMOcean catalogue is based on a OSS solution named CKAN, which stands for Comprehensive Knowledge Archive Network. It is OpenSource software with an Affero GPL 3 Licence, mainly focused on saving metadata, making it easy to find data. This project is sponsored and nurtured by the Open Knowledge Foundation (www.okfn.org). CKAN is mainly used by governments and private institutions to publish Open Data. Each service is deployed in a Virtual Machine with scalable resources (memory, CPU, disk) and the execution can be triggered by the user through the Web Portal via OGC Web Processing Service (WPS) or through an automatic execution process (scheduled or data-driven). 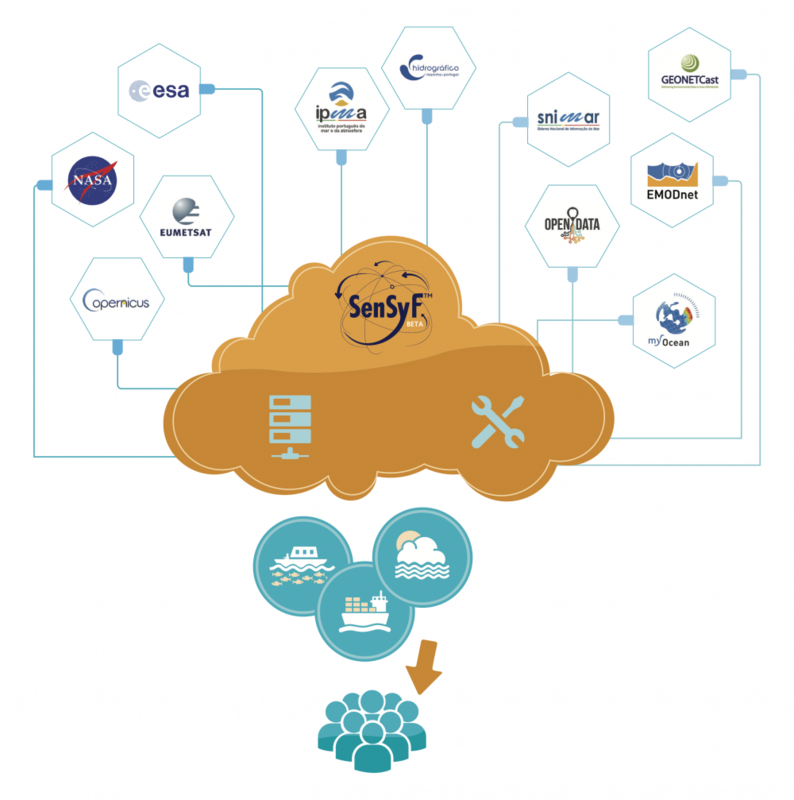 SIMOcean system platform is based on SenSyF, a geospatial Big Data framework with Cloud based processing capabilities. The SIMOcean system integrates an online Visualization Platform with a Geographic Information System (GIS) like interface to perform basic data visualization (pan, zoom, get info for pixel or area in a table or plot format), 2D plus time visualization capabilities and the ability to visualize several parameters at the same time using different visualization methods.